It's the 2 year anniversary of SeeUsEat and we had to celebrate with a fantastic meal. 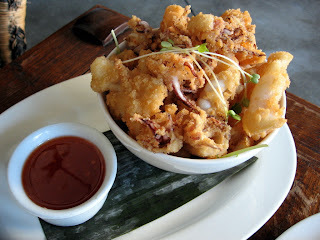 We had been hearing about Manresa quite a bit recently and when one of our favorite chefs, James Syhabout, left PlumpJack Cafe to go back to Manresa, this time as chef de cuisine (he was previously a sous-chef there), we knew we had to finally try it out. 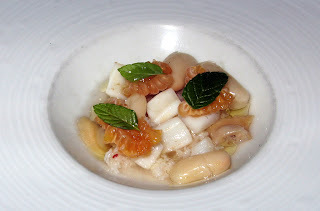 Overall we found our meal at Manresa to be very solid, although we were a tad disappointed to not see Syhabout's molecular gastronomy leanings coming through. We did, however, see his style in the beautiful platings--he loves to use tiny leaves and flowers, arranged to perfectly accent his dishes. The sweet dishes were less successful than the savory. None of the desserts were particularly interesting or memorable and we didn't finish any of them. 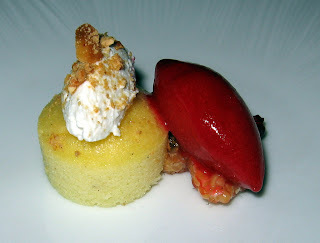 While the food was, overall, very good, we found Manresa to be seriously lacking on the service front. It's not that the service was bad, per se, but it was certainly not up to par with other restaurants in this price range. When we're paying over $100 per person, just for food, we expect a certain level of service that Manresa did not provide. Specifically, the waitstaff were not well educated on what was being served. We asked questions about the dishes that they didn't know the answers to (although, to their credit, they did go find and out and come back to tell us). They didn't fully explain all of the components of each dish. They didn't speak clearly or loudly. Furthermore, they failed the water test--Alexis always ordered tap water, as she doesn't like sparkling and Giao always orders sparkling. To us, a mark of good service is when the waitstaff continues to fill our glasses with the correct water, respectively, throughout the night. This didn't happen at Manresa. Also, we found it odd that throughout the night we were served courses by different waiters--we basically didn't have a dedicated waiter. There wasn't really anything wrong with this, but it was a bit weird. And finally, although there was a guy walking around with bread, we were only served bread once, while we clearly saw that he was refilling the bread plates of other diners. In any case, the food was good, but they really need to step up the service to make this place worth the price. The tasting menu was $125 per person. The pepper jelly was a bit odd--it was sweet and had the consistency of a gumdrop. 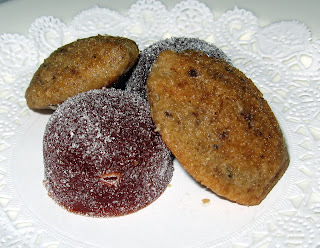 We did like the fact that it was cold, which contrasted nicely with the warm madeleine. The madeleine was tasty but we couldn't really taste the olives. 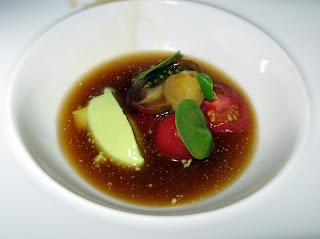 The soup, although oddly lukewarm, tasted like the embodiment of summer: clean, tart, just a bit sweet. 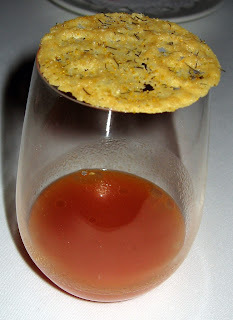 The tuile was delicate and flavorful, although the fennel was lost in the strong flavor of the parmasean. This was totally amazing. The crisp exterior gave way to a liquid center. This little flavor explosion was the perfect temperature as well, very warm, but not hot enough to scald the tongue. This dish was like an extremely refined babaganouj. It was super-smooth and very flavorful. Yum. 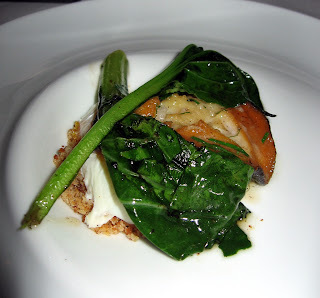 This layered dish was complex and delicious--sweet, savory and very, very creamy. Again, this dish was strangely lukewarm and we are not sure if this was the intended temperature. 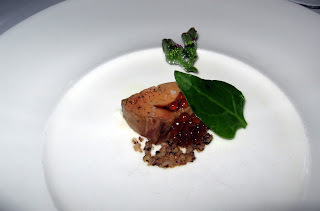 This was a solid foie gras preparation, but not the most memorable. This flower was totally bizarre. The "beads" you see on the surface exploded as you bit in, and gushed moisture into your mouth. 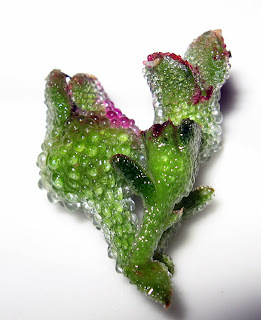 We're not sure if this exists in nature like this, or if it was prepared in this manner, but it was very interesting. This salad was flavorful and tasty, but really didn't need the white beans. Although the dressing was a bit salty, the mint and raspberry cut through the salt well. Again this dish was not warm and not cold, but it was delicious. The smoked roe were really great. 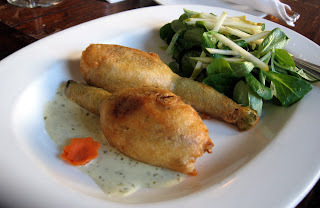 The smokiness added a great earthiness to the general salty flavor of the roe. This dish was very good, all around. The abalone was well cooked. 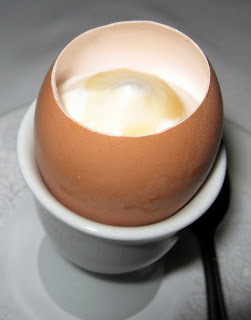 The "broken egg" was like a perfectly poached egg, but the yolk was the same consistency of the whites. We assume that the egg was cooked sous-vide to acheive this structure, but we aren't sure. 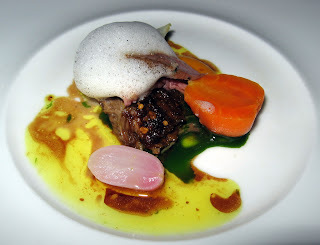 There were also little crunchy bits of something in this dish that really brought the flavors and textures together. 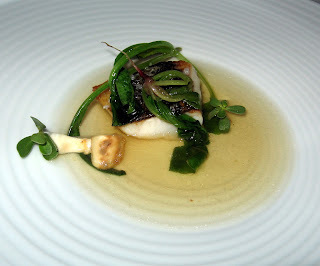 The fish was cooked perfectly and the broth was a flavorful addition. Very simple, yet wonderful. 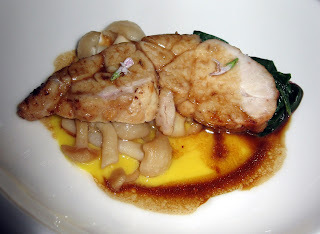 The sweetbreads were very gamey and large. This dish was ok, but not great. The thyme flavor also got sort of lost in the gaminess. This dish smelled enticing, but wasn't as good as it smelled. It was good, for sure, but not stellar. The frozen yogurt was sour and cold and earthy and good, but the soda was too sweet. The raspberry sorbet was smooth and tart and very good. The other side of the dessert was flavorless. The huckleberries added a nice tartness to the dish and it was certainly the most successful of the desserts, but it wasn't inventive or memorable in any way. 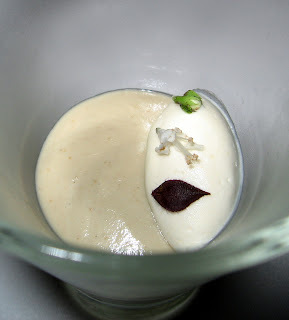 It was an interesting touch to end the meal with a sweet version of the amuse bouche that started out the meal, but this wasn't really very tasty. 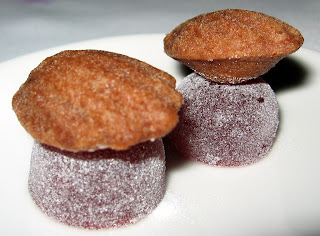 The madeleines were not particularly chocolatey and the strawberry gumdrops were too sweet and lacking in complexity (and much needed acidity). We went to meet some friends for lunch at Sonoma Chicken Coop in San Jose, a place we've never heard of, but which is apparently known for fresh, tasty food at great prices. The place really was a great value. We ended up ordering way too much food because we had no idea that the portions would be so huge. Overall, it was a very tasty meal and we still would have been stuffed if we had ordered 1 less dish. 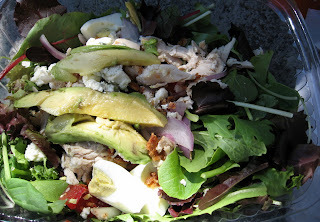 This was the least successful of the dished we ordered, but it was a still a huge salad full of fresh ingredients. 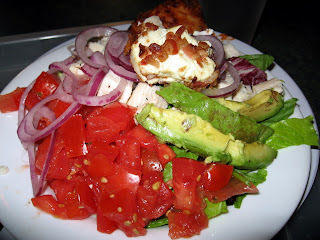 The main issues were that it didn't contain enough bacon and that the bowl was so stuffed it was hard to mix up the salad effectively to get a good bite with all of the ingredients in it. 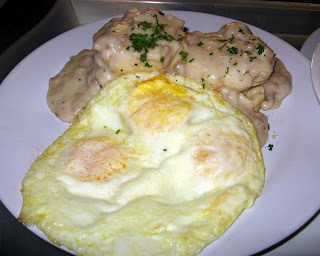 For some reason, despite our usual low-carb diet and the fact that neither of us are from the south, we have a real soft spot for biscuits and gravy. This was a particularly tasty version--the gravy was full of tasty sausage bits and the biscuits were light and fluffy without disintegrating in the gravy. We practically licked the plate clean. 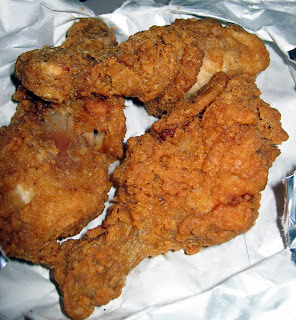 The dark meat was tasty and tender, but the white meat was a bit dry. The sauce was pretty tasty. A bit starchy, but flavorful and full of crab chunks. 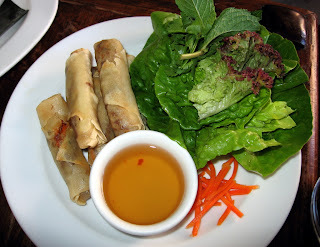 After Cafe Claude, we decided to get a real meal at Le Colonial, a French-Vietnamese place with a great open-air veranda. Since it was such a beautiful day it was great to enjoy a drink and a few appetizers on a comfy couch on a veranda above street level. Tasty, if a tad greasy. A bit too bready for us, but we liked that there were so many tentacle pieces. 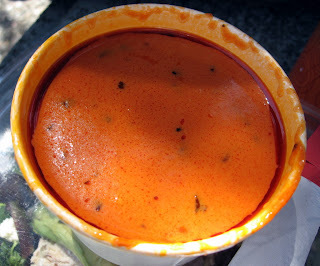 The sauce was also too sweet and had a bit of a snotty texture. Overall, not bad though. 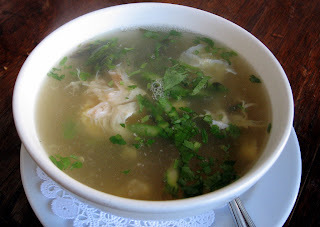 This was a much brothier, less gelatinous and oddly sweet version of this soup. 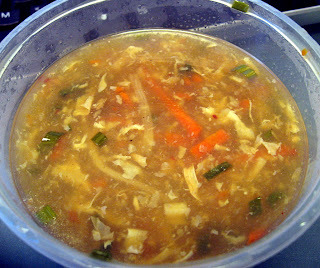 It was tasty, and used nice, big chunks of crabmeat, but very different from the previous renditions of this soup that we've had. These sounded better than they tasted. 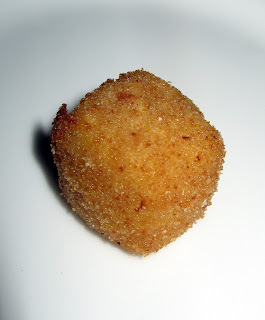 The stuffing had the consistency of a fish ball, but tasted a bit fresher. Overall, a little bland, and too expensive for the portion size. Since we had woken up (and started working) so early today, we figured we'd meet for a late lunch. After searching for a cafe where we could eat al fresco that wasn't closed until dinner, we finally decided on Cafe Claude. 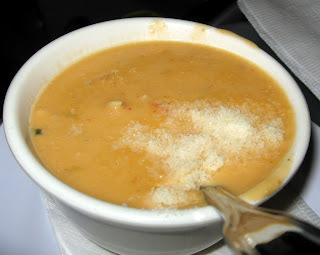 However, when we arrived at Cafe Claude we found out that while they were open, they weren't serving the lunch or dinner menu, but rather an in-between menu that consisted of only some sandwiches, soup and a few other assorted, cold items. Since we hadn't eaten since out early breakfast, we were looking for something more substantial, but we decided to stay for a drink and a bite anyway, while we figured out someplace to eat a real meal. 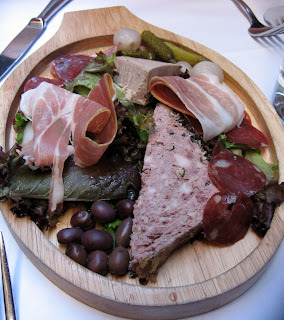 Duck Proscuitto, Country Pate, Foie Gras with Sauterne Pate, Chorizo, some olives, pickles and another unidentified meat. All were pretty tasty and went well with a nice afternoon glass of wine. 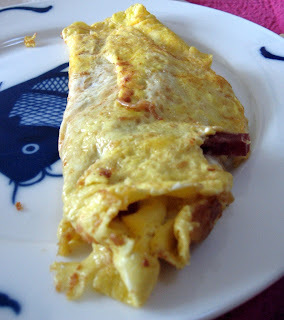 On a rare occasion, Giao woke up early and made us yummy salami and cheese omelettes for breakfast. We're still enjoying the bounty of summer. Mix together the mustard, vinegar and oil until emulsified. Pour over the cut veggies. Again, inspired by the farmer's market. 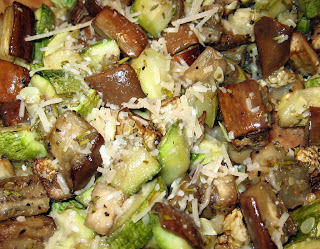 Toss the eggplant and zuchinni with all of the ingredients except the parmasean. Pour into a 9 x 13 baking dish. Cover with foil and bake on 375 for about 40 minutes, stirring occasionally. When veggies are soft and browned a bit, remove foil and sprinkle all of the parmasean over the veggies. Bake for a few more minutes. A simple and tasty weeknight entree. 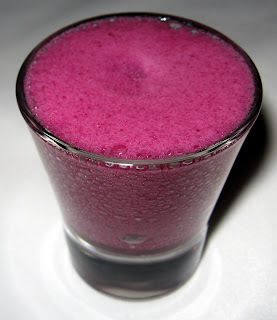 A bit tart, a bit sweet and very good. Sautee the onions over medium-low heat until carmelized. Stir the mustard and vinegar together until uniform. Pour over the onions and stir to combine. 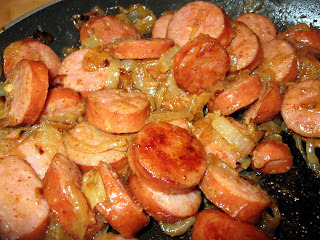 Add the kielbasa and sautee until heated through. 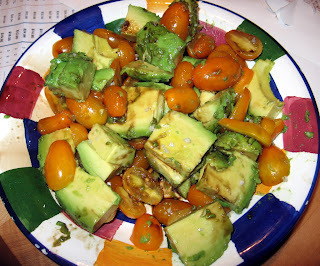 Dressed with balsamic vinegar and sea salt, this tasty salad was simple to prepare and very tasty. We had some leftover enchilada sauce, so we mixed it with browned ground turkey and some veggies and stuffed and baked these bell peppers. Place the bell pepper halves on a greased cookie sheet, but side up. 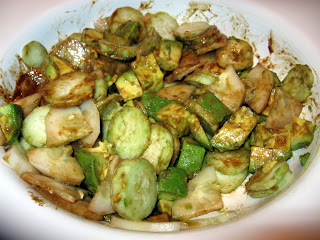 Sautee the onions and zuchinni in a bit of olive oil until soft, seasoning with salt and pepper. Set aside in a large mixing bowl. 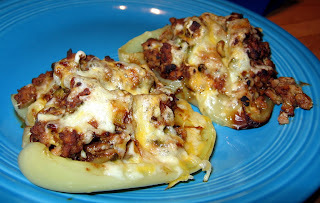 In the same pan, brown the ground turkey and season with salt and pepper and add to the onion and zuchinni in the bowl. Add the enchilada sauce to the bowl and mix to combine. Spoon the mixture evenly into the bell pepper halves. Cover with foil and bake on 350 for 1 hour. Remove the foil, sprinkle the cheese evenly over the stuffed bell peppers and bake for a few more minutes, until the cheese is golden and bubbly. Remove from the oven and serve. 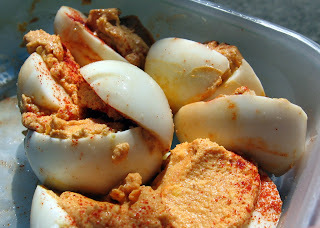 Today we had a variety of food from a variety of sources and we met to eat in the sun at a park on this gorgeous SF day. Smooth, a bit spicy and surprisingly delicious. A decent salad with fresh ingredients. A great, protein rich, handheld snack. We found out that this is a meal that reheats really well. Just remember to bring the salsa in a separate container so that you can put it on after the main dish is heated. We threw all of the leftover meat from the taco salads a few days back into a scramble, and topped it with tangy fresh guacamole. 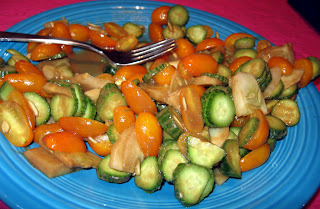 Dressed with a simple, mustard-y, balsamic vinegarette, these veggies shined. 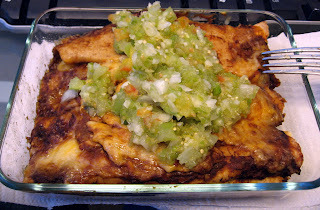 We decided to give our favorite brand of low carb tortillas a shot in enchiladas, a dish Alexis had never made before. These actually turned out pretty tasty and the leftover tomatillo salsa Alexis had made for taco salads a few nights before was perfect with this dish as well. 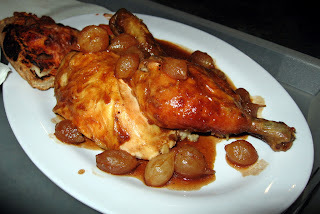 Poach the chicken breasts in a shallow pan with water and a few cloves of garlic until done--15 to 20 minutes. Shred or chop the chicken. Get out a 9x13 inch baking dish. 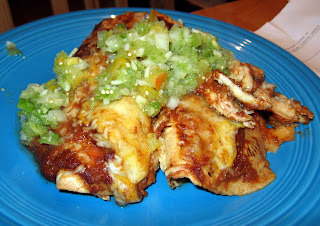 Lay a tortilla out and place some cheese and chicken in a column down the center. Roll and place in the baking dish. Repeat until all of the tortillas are filled and nicely packed in the baking dish. 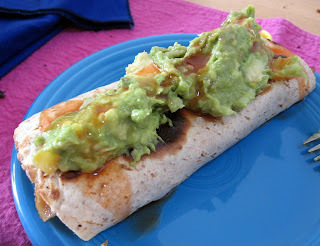 Ladle the sauce (recipe below) over the tortillas, sprinkle the remaining cheese on top and bake for about 10 minutes on 375, until the cheese is brown and bubbly. Sautee the onions, garlic and peppers in a bit of olive oil until beginning to brown. Add the rest of the ingredients, bring to a boil, reduce heat and then simmer for 20 minutes. 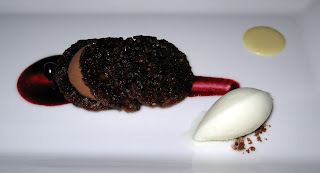 Puree with an immersion blender, a food processor, or a regular blender. A bit sub-standard today. Oily and not that flavorful. Good, as always. Not too gelatinous. 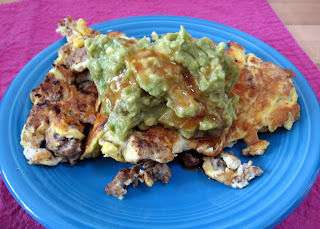 Wrapped inside a low carb tortilla, this breakfast is packed with both protein and fiber. 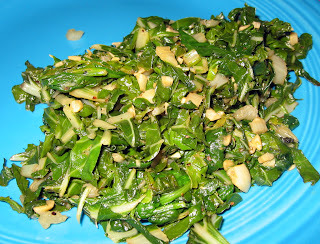 A very simple side dish. Sautee the garlic in a bit of olive oil until beginning to brown. Add the kale and sautee until wilted and tender. Add the spinach and sautee another 30 seconds. Season and serve. We cook these in the Ron Popeil "Set it and forget it" Showtime Rotisserie Grill for exactly 38 minutes. We parboil them for 15 minutes prior, then rub them with Alexis' no-fail wet rub and in less than an hour we have succulent, spicy ribs. 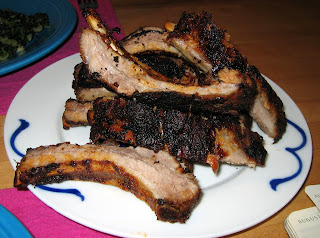 For some reason, today the ribs were a bit tougher than usual. We didn't do anything differently, so we can only assume it was the ribs themselves. 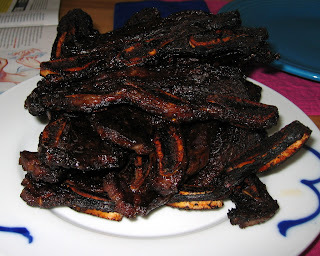 You can buy these thin-cut short ribs at any Asian grocery store. If you are in SF, try Sunset Super. We say "BBQ", but when we don't feel like breaking out the BBQ, we just broil these on high on a baking rack raised over a baking sheet, so that the excessive fat drains off. Flip them once the first side is looking slightly charred, about 5 minutes. 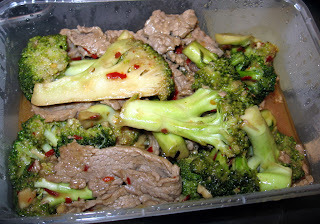 Marinate overnight, or for several hours. Broil as described above, or BBQ. The farmer's market is really a wonderful place in the summer. 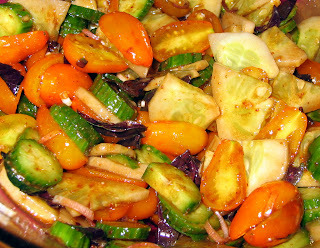 This salad, dressed with a simple, mustardy balsamic vinegarette, combined baby orange tomatos, baby cucumber, lemon cucumber, purple basil and ginger blossoms.